I heard a track in a friend’s mix recently and was literally stunned by it’s eerie excellence. A little digging later and suddenly discovered it was from a label I have enjoyed for many years and ran by a previous guest of Death Techno. The now Berlin based Affin, should be and must be on your favourites list. Ran by Joachim Spieth who is becoming the purveyor of some of the finest cuts you will hear at this time. 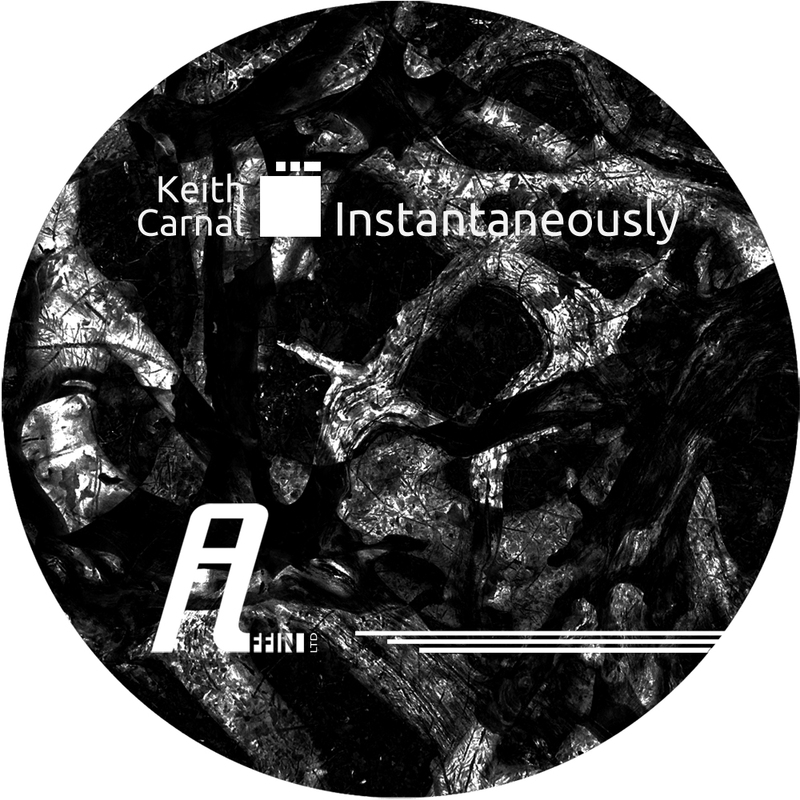 This EP from Affin stalwart Keith Carnal, is nothing short of sublime. The title track “Instantaneously” manages to hold a solid groove and melancholic balance with consummate ease. It confidently drives you forward with pounding kick and crashes, with an atmosphere comprising of muted lazers to barely recognisable nature calls. Soon it throws at you spellbinding, emotionally charged notes, that flutter around like an accordion. A real floor monster. The remix is from Subjected of the prolific Vault Series project given the tag “Rave Edit.” It goes straight at it, brandishing instantly, a creepy siren and powerful beat. As it rolls on, the suspense builds from what sounds like drenched castanets and pitch bending hats, as a lead synth note starts becoming the main focal point with an extra subtle wobble placed in the bottom end. Adding some more gloomy sounds it rises high then breaks like a tidal wave and destroy everything in it’s path. “Hundge” is one of the best tracks I have heard in a long time. A thundering beat is soothed by spitting hats panning around your ears and tension builds like a ferocious beast. Soon in the distance you hear some lead notes that sound like ghost whispers and are ridiculously satisfying to my ears. Adding some soaked white noise, claps are thrown in for extra impact as it broods away. Coming off as a cross between a tool and absolute killer track, it is near perfect in execution, never succumbing to trying more than it has too to succeed which many find hard to achieve. The fourth track is by no means least, as this EP is full of bombs and decapitating gold. “Untold” takes on a massive groove again, while going down a deeper route which it may not seem at first because it’s just so heavy! A sparse atmosphere takes hold as delayed and softened lead notes give this one a slightly ominous feel. Panning beeps are apparent too for extra mystery to ensue and leaves you in a trance come the final moments. Such a lethal collection of the highest quality Techno. This entry was posted on June 9, 2015 by Death Techno. It was filed under DT:Reviews and was tagged with Affin, DTR, Keith Carnal, Subjected.